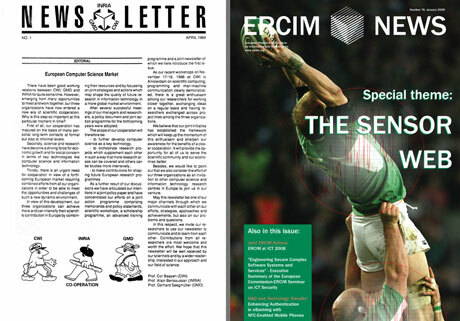 Twenty years of ERCIM stands also for twenty years of ERCIM News. ERCIM News was one of the first activities of ERCIM and with its 77 issues it has born witness to the advances in European R&D and Innovation in Information Technology and Applied Mathematics during the last twenty years. "May this newsletter be one of our major channels through which we communicate with each other on our efforts, strategies, approaches and achievements, but also on our problems and questions". That was the way the directors of CWI, INRIA and GMD, Cor Baayen, Alain Bensoussan and Gerhard Seegmüller started the first issue of the 'ERCIM Newsletter' in April 1989. Since then ERCIM News has evolved from an in-house magazine to a publication covering reports and news about scientific projects from all over Europe and even beyond. ERCIM News issues number 1 (1989) and 76 (2009). From the early issues on, ERCIM News has been published regularly four times a year. With each issue focusing on a special theme, the ERCIM News series has become a unique collection providing an overview on different topics of Information Technology. ERCIM News was also a pioneer in online publishing. When the Web entered the research institutes in the early nineties, the question about an on-line version of ERCIM News was soon raised. From October 1994 on, the newsletter has been published both in printed and electronic format. The attractive full colour cover was first introduced in 1999, in concomitance with ERCIMs tenth anniversary, and has been a crucial factor in the transition from an in-house newsletter to a popular scientific magazine. Against all expectations, the electronic edition did not diminish the value of the printed edition but many readers on the Web subscribed to the printed edition, thus increasing its circulation. Beside the currently free subscription to the printed edition, the ERCIM News Web site gives access to all previous issues in electronic form. ERCIM News today has a circulation of over 10,000 copies and is distributed in over 70 countries. More than 1500 articles have been published in twenty years, mainly written by scientists reporting on their research activities. The popularity ERCIM News has achieved is first due to the authors to whom the ERCIM Editorial Board wants to express their warmest thanks on this occasion.